For her eleventh birthday, Sarah Grimke was given a slave of her own. She befriends her slave, Handful, and promises herself that she will not only realize her own dreams of becoming a lawyer, but will also free her slave. The narrative switches back and forth between Sarah and Handful throughout this novel about abolition, women's rights, religion and family. I'll admit right off the bat that I did not go into this book with a very positive attitude. It's on our shortlist for the Community Read, or else I wouldn't have even picked it up. 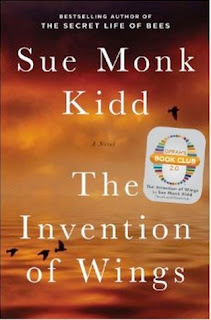 It sounded like many other books, and I wasn't sold by the protagonist with seemingly-modern sensibilities, the white author writing about slaves, or the Oprah Book Club sticker on the front. Throughout the early part of the book my feelings didn't change. I felt like Sarah was a little too modern, and most of the characters too easily sorted in categories of good guys and bad guys. It was an issue book and I felt sort of indulged by the character of Sarah, the crusading abolitionist. But then it all turned around for me. As Sarah and Handful got older, their beliefs and personalities solidified. When Sarah returns to the family home after an absence, Handful remarks on her character, saying "She'd been boiled down to a good, strong broth." The people and issues began to all come together to form a more realistically complex tapestry. Sarah was forced to face her own prejudices, her potential love interest was revealed to be less perfect and supportive than he seemed (without being made into an oversimplified jerk), and the issues started feeling much more like real life than moral lessons. 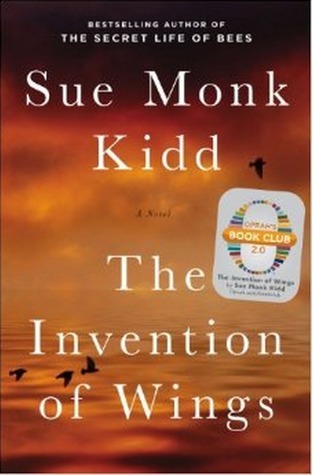 My favorite thing about this book is the way it examines the relationship between civil rights and women's issues. The movements seem so similar, yet just as some people worked towards both ends, the movements were sometimes at odds with each other. This became apparent in this story as Sarah and her sister Angelina began speaking out against slavery and faced criticism and ostracism for their outspokenness. Sarah even had to choose between her goal of becoming a Quaker minister and hopes of getting married, and her abolitionist work. Sarah was a better character for her imperfections. Progressive though she was, she still had blind spots. When he father tells her she will never actually be able to study law, she laments: "My aspiration to become a jurist had been laid to rest in the Graveyard of Failed Hopes, an all-female establishment." Yet down the hall are slaves who are forbidden to even learn to read. Does she not recognize their hopes also buried in that graveyard? Like many of us, Sarah also did not know when to keep her mouth shut. Late in the book she is trying to convince her mother to do something and almost gets her on board, but gives in to her emotions and begins lecturing her. Had she just pulled back a bit, she would have gotten what she wanted, but instead she went just a step too far and ruined her chances of making a deal. Despite my initial misgivings, I ended up liking this much more than I expected to. It got a little slow in the middle, and I was always more interested in Sarah's story than Handful's for some reason, but overall it gave me a lot of food for thought. I read this for both book group and the community read committee (two birds, one stone!) and it's definitely a great discussion book. I've got a couple more books to read for the community read nominees so I don't know which one I'll vote for, but I can definitely see great programming potential with this one. If you're interested in abolition and early feminism, or just enjoy a story of complicated family relationships, I'd highly recommend picking this up.